Any time you have a regular vacation destination, there are certain landmarks that persist. My gramps lived here when I was born, so I’ve been visiting the North Fork since before I can even remember. While I’m more intimately acquainted with the beach and the park than any stores, the ice cream here persists. Most of the places have changed names, the grocery store used to be an A&P and is now a Waldbaums. The deli I would go to with my gramps to get the newspaper burned down a few years back and was replaced by a new one that lacks character. Even the Beer & Soda shop finally closed this past winter after the owner died. Magic Fountain has always been here, when I was little and saw it I knew we were here, as it is at the intersection where we had to turn. My brothers and I drove here together. We bought a bag full of bagels to make lunch with the leftover duck I picked up the day before at the Modern Snack Bar. While Pete has been stranded in Chicago without any pizza he likes, that was what he craved so he went to the pizza shop, Tim and I walked a few hundred feet for cones instead. I looked at the flavors, had a sample of the honey cinnamon, and then decided to get a whole cone full of it. As seasonal flavors go, this was exquisite, though I’m not sure what makes this season the right time for this. Maybe it’s the pervasiveness of flowers that in turn help bees make honey that make this a summer flavor. 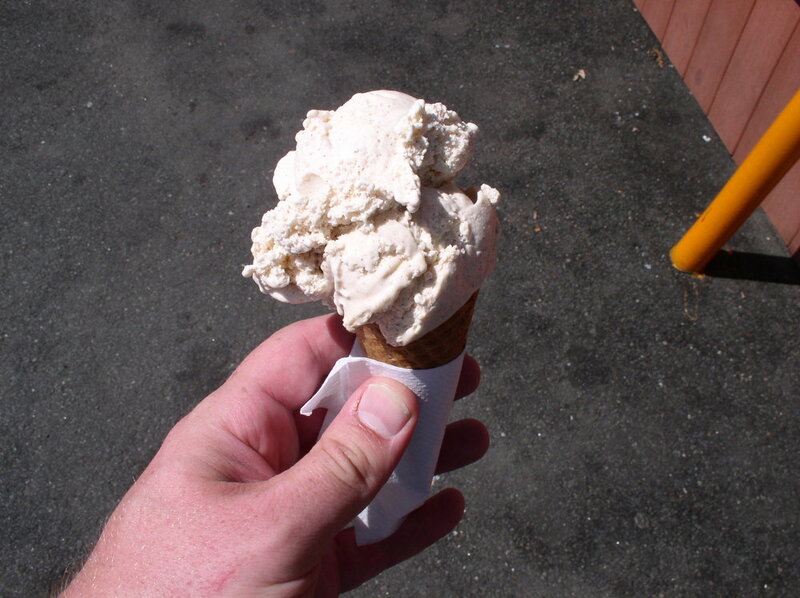 The cone was nicely creamy, with a light cinnamon flavor and the honey carrying the sweetness throughout. I was forewarned that the ice cream was a bit soft, but balked at a cup and had no problem making it through a small cone before I got any drips on my hands. With a few dips in the ocean during the morning, a great cone, and sandwich, it makes for a great birthday as I prepare to venture back to Boston in time for my radio show this evening. A hop on the ferry gets me to Connecticut and then it’s a short hop up 95. Hopefully I’ll find a few more cones along the way.